We are holding onto summer for as long as possible with this sweet summer corn. As you probably know by now, we love using local produce from the farmer’s market to make delicious vegetable dishes and there’s nothing quite like locally grown organic corn. Although corn is often not considered the most superb veggie (ie, it’s not like kale and broccoli), it does have some health benefits. Corn is definitely a source of carbs, so if you’re on a low-carb diet than you’ll want to skip this one, however corn does contain fiber and has a low-medium glycemic index, so it doesn’t spike blood sugar as much as refined grains. Corn contains some of the B-vitamins, including B6, folate, pantothenic acid and niacin. Corn is a good source of some antioxidants including lutein, which helps protect the eyes from blue light (the light you see from your cell phone, which unfortunately we are being more and more exposed to everyday). 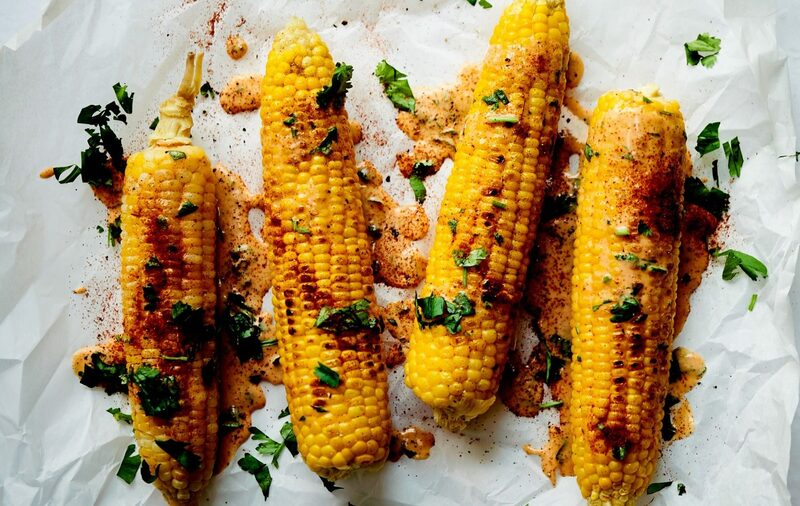 To make this grilled corn extra delicious, we made a sauce with coconut milk and coconut yogurt as the base. Researchers have studied coconut milk for it’s MCT (medium chain triglycerides) content, which is an easily digested and absorbed fat that’s great for boosting energy and keeping you satiated for longer. We love using fresh cilantro in this recipe for added flavor, to support digestion, as well as to provide some extra vitamins and minerals. If you don’t have a grill, you can modify this recipe by steaming the corn on the cob instead of grilling it. Another option is to cut the cooked corn kernels off the cob and add them to a salad with the coconut sauce. Let us know if you give the recipe a try! Remove the corn husks and place the corn in a bowl of cold water with a pinch of sea salt. Let it soak for 20 minutes. Mix the sauce ingredients together in a bowl and whisk until smooth. Adjust seasoning if needed. You can always add more spices or lime juice, if you prefer. Heat the grill. Rub a tiny bit of coconut oil over the corn and then place on the grill. Grill for about 15 minutes, making sure to rotate the corn every few minutes to prevent it from burning. Once ready, drizzle the coconut sauce over the corn. Sprinkle extra cilantro and black pepper over top before serving.